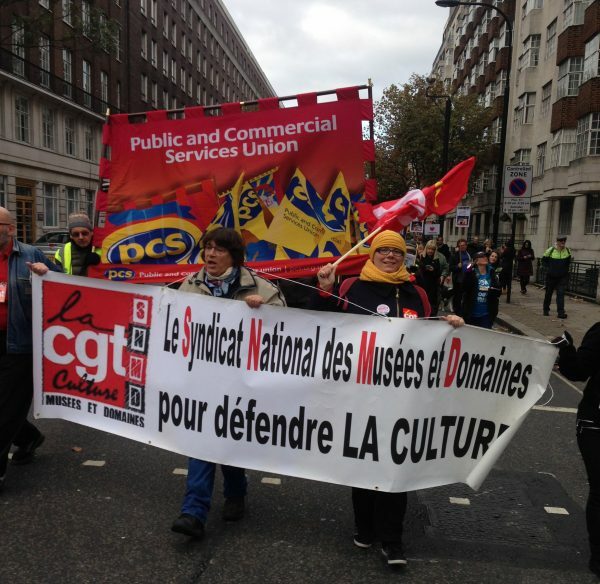 French workers marching in London against Library closures. Great antidote to Brexit. “The Brexit battle is intensifying” saying Ian Birrell (Independent 7 November 2016) in an article entitled “The Battle for democracy”. He says “at the heart of Brexit lies one word: democracy”. This is now becoming more contested as “the debate throws up deep issues over the nature of democracy”. It is no simple matter. “Democracy, of course, goes far deeper than simply voting every few years, something underscored by despots who get their regimes rubber stamped in dodgy elections”. During the referendum, leave campaigners appealed to alienated sections of the working class. They “tapped into a visceral sense of popular unease over elitism and the lack of power”. Trump has played the same card. Brexiteers claimed that “our democracy” was stolen by EU bureaucrats as jobs and pay were undercut by EU migrants. “This was the rallying cry of the triumphant campaigners against the EU, declaring in the vaguest terms that Britain must “take back control”. The Brexit case was thus a strange brew of democratic, British nationalist and racist arguments. Of course democratic arguments appeared on both sides of the EU debate. Both could agree that the EU was not democratic. Yes the bureaucracy in the EU and UK serves corporate interests. However we have not lost “democracy” because we never had it. The relationship between the EU bureaucracy and the feeble European parliament is a mirror image of Whitehall bureaucrats and Westminster ‘democracy’. The UK is an oligarchy not a democracy. To find the origins of the problem we have to go back to the seventeenth century. In making their decision over who has the legal authority to trigger article 50 to leave the European Union, the High Court judges (3 November 2016) say “the bedrock of the British constitution is …the supremacy of the Crown in Parliament”. They explain this “was decisively confirmed in the settlement arrived at with the Glorious revolution in 1688 and has been recognised ever since”. The people did not figure in the equation of power. Today the Crown, Parliament and People might seem like a circle with power moving around between them. Now the power of the people appears momentarily in elections and referenda. On 23 June a majority of people in England and Wales voted to leave the EU. The Crown lost control of the situation. With typical speed and ruthlessness the Tories dumped Cameron and gave his job to May. With the slogan “Brexit means Brexit” the Crown took back power as surely as if they had mounted a coup. Now they will negotiate in secret and inform parliament and the people at a time of their own choosing after the ‘best’ deal is signed and sealed. The Crown, through its Ministers and Mandarins, primarily serves the City of London whose merchants and bankers won the 1688 revolution. What plan is currently being worked on? It is a plan to get the best outcome for the City and one designed to divide the working class. Of course as in all diplomacy between imperialist powers some clauses will not be revealed to parliament or people. The winners and losers of so-called Brexit will be the same class which emerged victorious from the great banking disaster of 2008. Birrell explains the current legal dispute in the High Court as a struggle between parliament and people. He says “many of our current tensions arise from a mandate delivered through direct democracy clashing with the representative democracy embodied by Westminster”. This is how the right wing Brexit press attacked the High Court judges as “enemies of the people”. As in 1688 the UK constitution still involves a struggle over the use Crown’s prerogative powers against Parliament, coming to the fore in times of crisis from Iraq to Brexit. So far the British left has largely failed to take up the democratic questions either correctly or seriously before during or after the referendum. They conceded hegemony to the Tories and UKIP. The Labour Party accepts and supports constitutional monarchy. The revolutionary left has no track record in fighting to extend democracy. It is the party of protest not the party of power. Left Unity has to break from both those kinds of politics. The people of England, Northern Ireland, Scotland and Wales were given a binary choice. With a myriad of motives and levels of consciousness they voted between the two options. The Tories and UKIP give racist interpretations to serve their own interests. But democrats point out that the people were not given a choice over what was the best kind of exit. They have not been consulted over managing the process or on the terms of leaving. The nations who want to remain have not been offered self determination. At the recent Left Unity conference the party called for a Democratic Exit and rejected the right wing slogan of Brexit. Socialists must fight for a people’s Dexit against the City’s Brexit. Demanding a fully democratic exit must include mobilising for a democratic revolution, the transfer of power to the people combined with the struggle for workers rights. Scotland is still the key democratic battle ground. Republican socialists endorse Ian Birrell’s claim that “at the heart of Brexit lies one word: democracy”. This means nothing unless it becomes a programme for a democratic revolution which rejects the sovereignty of the Crown-in-Parliament for a Commonwealth in England founded on the sovereignty of the people. “The battle for democracy” did not end with the Tory referendum. It has only just begun.